Are there any style guides that dictate the use of “on/at Amazon” (and other web platforms). If so, what are they and what's the reasoning behind it? You can get a good audio version of it over on Amazon. 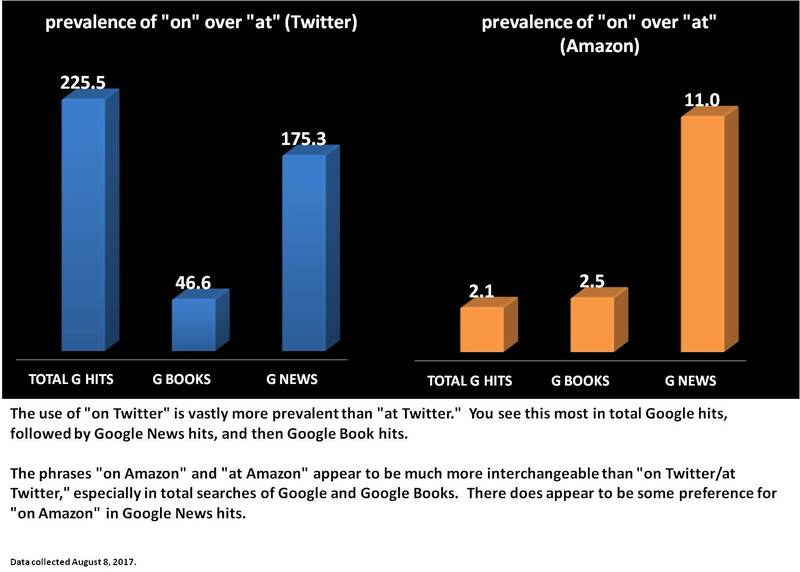 In the charts below, the columns indicate the number of times more prevalent "on" is over "at" (although there is one exception and I comment on that). 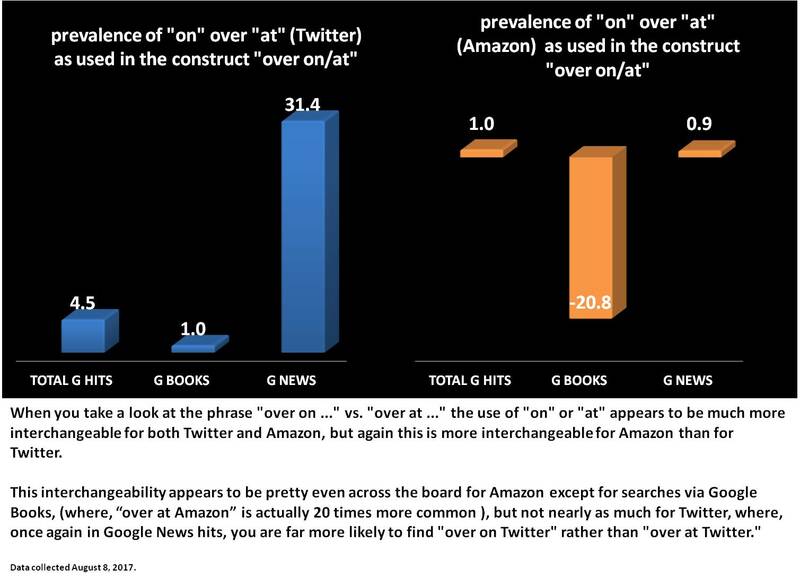 This then makes sense why "over on Amazon" and "over at Amazon" sound equally as good to me ... they are being used virtually interchangeably and, in fact, "over at Amazon" may actually be more prevalent in some registers. Anyone reading this may have come to the conclusion that I've answered my own question, but really what I am looking for is some sort of style guide that dictates the usage of one over the other. If I have some sort of authoritative guide that dictates one over the other, I will continue the somewhat tedious task of swapping out "at" for "on." Now knowing that at least informally, there appears to be some amount of interchangeability, to continue doing this without any formal guide prescribing one over the others seems rather silly, unnecessary, and unproductive. From the disparities of "on" over "at" via news searches, I have to assume that there must me some sort of proscription going on. Anyone happen to know? This might be cleared up by using the terms in their less-used constructs and seeing how they sit with you. Amazon is a unique case, I believe, since Amazon is both an "at" and an "on". If you are referring to Amazon's retail sales at www.amazon.com, then either would work, however, if you refer to AWS, then "on" would be more common. Not the answer you're looking for? 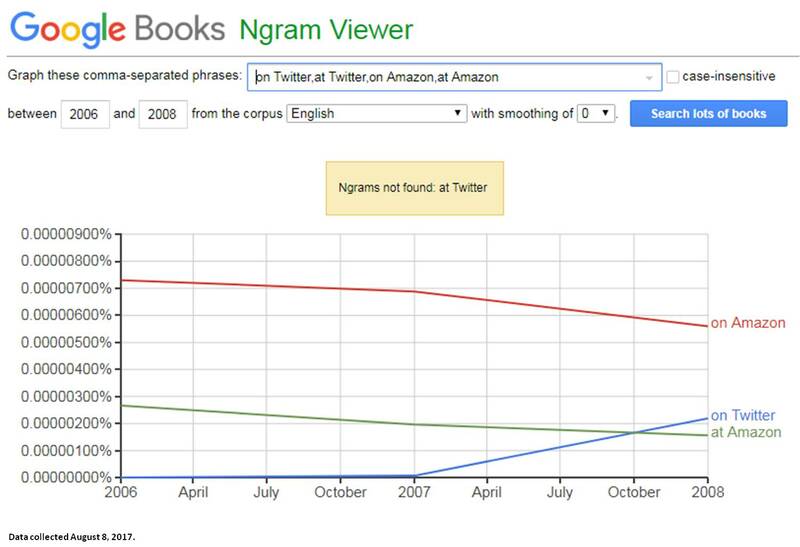 Browse other questions tagged usage phrase-usage style-manuals social-media journalism . What word can be used to describe someone you're following? Are there any names of food that are associated with political correctness other than Fried chicken? What is the meaning of the phrase “this side of x”? And how do I use it? Can laboring and belaboring be used in the same way? Do any style guides advocate the alternating use of “he” and “she” as a gender-neutral pronoun? Is there any difference between “straighten out” and “sort out”? “On behalf of” or “On the behalf of”?